It’s easy to tell when your child needs to visit a doctor if they have physical injuries. When you see a cut, large bruise, or severe break, you’ll know right away that they need medical attention. But there are plenty of medical issues that aren’t as easy to identify. If your child is experiencing any pain or discomfort with their ears, nose, or throat, you should visit a pediatric ENT doctor. Here are some common pediatric conditions that require ENT medical assistance. If you notice your children struggling with any of these problems, contact a skilled ENT specialist right away. Sinus issues can be quite severe and are often disguised as minor colds — so it’s important to monitor your child’s progress at all times when they’re nursing a cold. If their nasal congestion continues for more than a week, that could be a warning sign of further sinus issues. Also be on the lookout for swelling around their nose, worsening cough, and reported pain in their jaw or forehead. The tonsils and adenoids are areas of tissue located at the back of the throat. Though tonsils are located on both sides of the throat and are clearly visible, adenoids are not visible at all. Tonsil and adenoids can become enlarged and lead to difficulty breathing, swallowing, sore throats, and even cause further infections. The American Academy of Otolaryngology reports that roughly 20% of all tonsillectomies in children are performed because of recurrent infection. If you notice your child complaining about a sore throat any other issues with the back of their throat, that could mean issues with tonsil and adenoids — talk to your ENT doctor about pediatric tonsil removal. 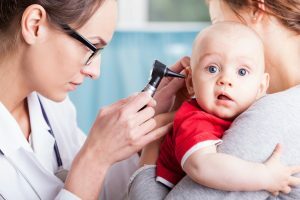 Ear infections are caused by bacteria and often after a child experiences other health issues like a cold, sore throat, and additional upper respiratory problems. Because of the infections, fluid will build up behind the child’s eardrum and lead to discomfort and further pain. Be careful cleaning your child’s ears and take any complaints about ear discomfort seriously. Obstructive Sleep Apnea (OSA) is a problem that can affect children. One of the most common symptoms of OSA is loud snoring. This can result in disrupted sleep and tiredness during the day. When this condition is left untreated, children can find it difficult to concentrate in school. The most common cause of OSA in children is enlarged tonsils or adenoids. As mentioned above, speaking with a professional about removing the tonsils and adenoids can be a solution for OSA in children.